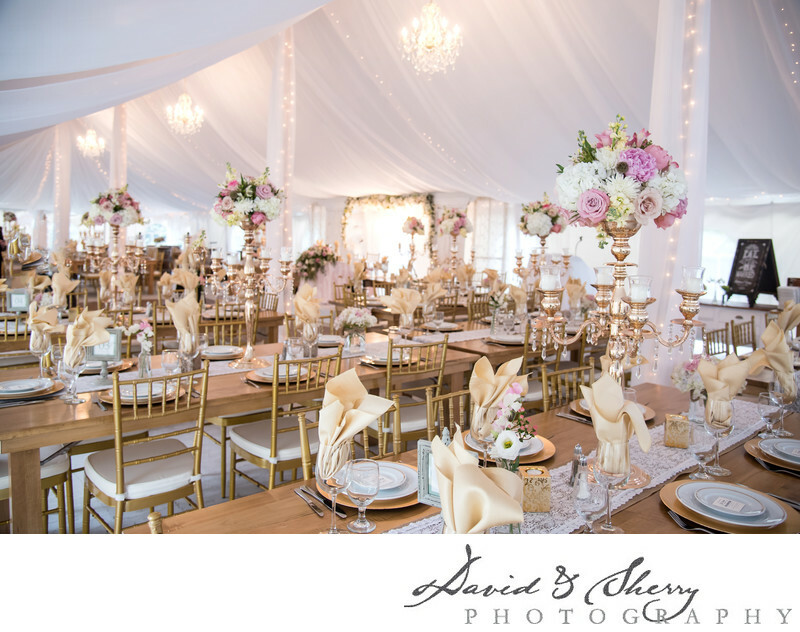 Luxury decor for a tent wedding in Southampton and Port Elgin is something that will set the theme of the wedding apart from many others. This wedding's gorgeous gold, crystal and floral center pieces turned a white tent into a dreamland. From an experience point of view, when you walk through the tent flaps to see the decadence which was spread across the space you felt as if you were walking into another world. The head table which was only seating for two was ornately fashioned with a mix of designed elements with a touch of DIY. Photography was very important to this couple and though we were challenged by a heavy fog which had rolled in, we timed things correctly to have wonderful coverage to each part of their wedding. Not withstanding the details in her flowers, her shoes, her beautiful engagement ring, earrings, something blue, and something borrowed. The bride radiated with her dress and everything it entailed. Port Elgin is often populated by the wonderful people who work at Bruce Power, and this too was a wedding of their people. The beach front location of Port Elgin makes for a great spot for a wedding. The marriage was supposed to take place on the beach but the fog made that impossible. We were able to squeeze their formals into the window we had at the beach without rain but their ceremony was moved into the tent. Some re-arranging had to take place to make room for all of their guests and though it was a little bit tight as due to the tables sharing the space, but everyone still had a wonderful time and they were married under the tent surrounded by this beautiful decor.